Hey everyone, I haven't posted in quite a while but I thought I might now to see if anyone's interested in this project! I just bought Fez when it came out on PC a week ago and I had a lot of fun with it! One of the more interesting parts was deciphering the in-game language, but translating back and forth was a bit cumbersome. So I thought I would make a translator for TI-84+! I have basically nothing right now, but it shouldn't take me a few weeks to complete it. 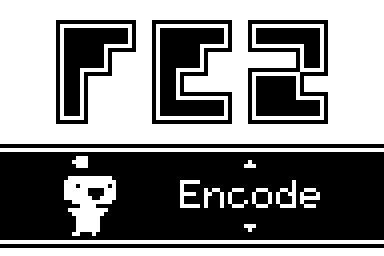 Right now I'm thinking of allowing the user to encode a string written in English, decode a string in the Fez language, and pair Fez characters with English characters (the program WON'T have these pre-loaded, to require the player to still decypher it himself). What do you guys think? Does/did anyone here play Fez? I think there are online versions of this but I thought it would be fun to make one for the calculator anyway! That looks great, look forward to this being completed. Could you link to a video of the game? Might it be possible to port the actual game to calc? Interesting. I'Ll have to check out on Fez, though, because I have no clue what it is lol. I have never played fez, but it looks like a fun platformer. I have seen some gameplay and the main feature is that the 2d world can rotate in 3d space. I just made this mockup. I don't think anyone is going to make this happen any time soon though. Never heard of Fez, but that mockup looks fantastic! I imagine it would be quite difficult to port Fez if it can even be done. Fez is an indie game that was in development for about 5 years. It was released exclusively for Xbox 360 last April but has now been ported and released for PC. It's a platform game all about puzzle solving, the cypher is just one part of that. I had been looking forward to playing Fez for a long time. Took me 17 hours to complete. It would have to rely solely on the rotation mechanic, since the puzzle aspect would likely be lost with so few pixels to work with. It would be neat to see, but I don't think it would do well beyond a 'tech demo' since the puzzles are so integral to the game experience. What kind of puzzles are they? are they also based on clues you get out of the graphics? If not, then it might be done (Though I'm not going to do it, haha). It might be cloned to nspire though. Most of the puzzles aren't directly given to you - the player needs to pay close attention to the environment in order to find the solutions. Without the "discovery" element most of the puzzles are actually easy and/or not fun. Maybe for the CSE with the higher resolution? The code would have to be really optimized. Nspire or prizm would be easier yeah. Page created in 0.733 seconds with 58 queries.